Cross-posting my Medium post, which followed my attendance at the first Responsive Org conference. I’m including this because one of the reasons we can choose to work differently is for more personal freedom–to work where and when is best for us and our family, friends, or community. Some people feel they have to join a global company in order to feel like they can change the world. I had to leave one. Six months ago, I was in what should have been my dream job, and in some ways it was. I’m energized by the notion that new collaboration tech can revolutionize the way that we work, and I was at the forefront of that effort within one of the largest, most advanced tech companies in the world. After 16 years there, I found that all of their tech and resources were powerless against a culture that struggled to let go of politically-driven hierarchies and silos, interminable meetings, and a debilitating addiction to email. I left to join a small consulting agency specializing in internal communications so that I could continue pursuing my passion to transform work. What I found has already transformed my life, and I think has the potential to change the world. We have what we call an “Office Anywhere” policy. If you want to work at home, from coffee shops or co-working spaces, from your grandmother’s or the office, you can. We work wherever we’re the most productive in a holistic sense. We’re generally available during business hours, but there’s lots of flexibility there too. We have remote employees in other parts of the US and the world, and they’re a diverse mix of single moms, new college grads, and old farts like me. This is all made possible by a digital office made up of tools like Facebook At Work, Asana, and Skype. 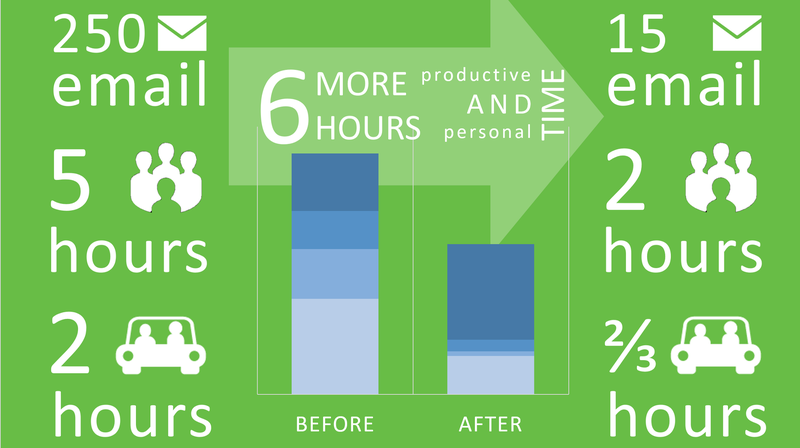 My average day in the global corporation used to include 5 hours of meetings and 250 emails, which was very typical. That’s now become less than 2 hours of meetings and 15 emails, with most of the collaboration happening in other ways. I’ve gone from working 10 hour days, to working 4 hours some days and 12 hours other days (more often 8 or less). My commute time has dropped from 10+ hours a week to about 3. Have you ever had the experience when woodworking or plumbing of struggling to make a cut or turn a bolt properly, and then finding the proper tool for the job? Remember how the time and effort saved washed over you like a cool shower? That’s the feeling I have now in using the right collaboration tools in the right ways. The digital office is an evolution of the brick version, and the impact it can have on everything else in our lives is revolutionary. The digital office is the pebble thrown in the pond that leads to waves of change. While the concepts of cutting down on commute time, being able to hire people from any location, or having more time to spend with family aren’t new, there’s an aspect of the latter that may be the biggest game changer in this new world of office-optional work. Studies are showing that employees that are able to take advantage of flexible work arrangements are more productive, more loyal, and more satisfied with their jobs. This is certainly the case with our office. Perhaps the reason for these improvements has less to do with traffic and more to do with our DNA. I recently attended the first Responsive Organization conference, which promotes discussion about the future of work. One session there was especially aligned with thoughts I’ve been having about our ancient ancestors. Jessica Prentice gave a presentation based on her wonderful Medium article: The Most Dangerous Notion in “Reinventing Organizations”. She makes the case that the indigenous Americans knew how to self-organize and create highly productive and sustainable communities long before we ever conceived holocracies, gig economies, or digital offices. Since the beginning of the agricultural age in 10,000 BC, families lived *and worked* together. It’s only been since the industrial revolution that one wage earner actually left the home to earn money, returning at the end of the day or the week. Only in the last 50 years have we seen both parents leaving the home. Has our species adapted well to that fundamental change in the family dynamic? We justifiably denigrate the deadbeat dad, but is the damage done by a father that pays the bills but isn’t around for any of the important events of a child’s life that much less? Instead of wringing our hands about homemakers vs. career moms, why can’t both parents provide and parent truly equally because they’re both at home a LOT more often? What makes my experience different than the average “I work at home / am a digital nomad and am so much happier / more fulfilled” story? I didn’t take a pay cut in order to do it. Our company isn’t taking a hit in productivity. Quite the opposite. I’m not doing it so that I can indulge a hankering to travel to exotic places. I’m doing it because I can participate more in my daughter’s education. I can be there for my son, who’s received a troubling diagnosis and is on a journey that sometimes needs mom, sometimes dad, at unpredictable times. I can work from another state for a week, helping an ailing great aunt to put her affairs in order. I can serve my community in new, more flexible ways. And I can do all of this while the revenue and productivity for my business grows. Perhaps, just as we worry about the negative impact of the digital mediation in our personal relationships, we should also wonder at the positive impact that digital commuting can have on our most intimate relationships with family and close friends. The promise of increased productivity should never have been just the ability to produce more stuff, more work, and ultimately more stress. It should be about producing healthier and happier people. Sustainability should be about so much more than the environment. It should be about how to sustain our own energy, our families, and our communities. Can digital commuting really change the world? What if nearly all of our knowledge workers got off the roads so workers that still have to be physically present could more easily get to their jobs? What if office buildings looked more like community centers than cubicle farms and were distributed more evenly instead of concentrated in downtowns? What if we took all the energy currently invested in office politics and focused it on better governing our local communities? What if “location, location, location” was no longer a thing, and you simply lived where you worked or worked where you lived?